The production of west European pear, Pyrus communis, is concentrated in the temperate regions of Europe, North America, South America, South Africa, Australia and New Zealand. The species probably evolved in Western Asia and the Caucasus Mountains of Eastern Europe. The first written record of pear cultivation in Europe is that of Homer (about 1000 BCE). Propagation by grafting and cuttings was established by the time of Theophratus (371 – 286 BCE) and cultivars with distinct names were known. Many buttery-fleshed cultivars were developed beginning in the 18th century, supplanting previously selected hard, cooking pears. Like all Pyrus species, most of the cultivars are diploids (2n = 34), although a few triploid and tetraploid cultivars are known. The nuclear content of P. communis is 1.03 pg/2C. The genome size of the ‘Bartlett’ cultivar is approximately 577 Mbp per haploid nucleus. The natural growth habit of the plants are large trees with upright to spreading habit. Fruit cultivars are clonally propagated by grafting or budding onto seedling of clonal rootstocks. Clonal rootstocks are propagated by layerage, hardwood or semi-hardwood cuttings or micropropagation. Most of the fruit are consumed fresh, although fruit are also canned, pureed and dried. Pears are a good source of fiber. Pears contain phytonutrients, particularly phenolics, which have been found to have disease-fighting properties. Priority breeding goals include fruit quality (flavor, freedom from storage disorders, long storage life), precocious bearing and high annual production, resistance to disease (fire blight, Fabraea leaf spot, pear scab, Pseudomonas blight), and insect resistance (pear psylla, codling moth, mites). 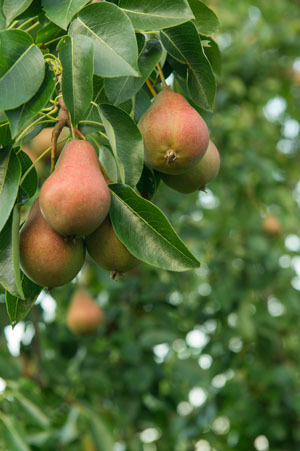 Primary goals for rootstock breeding include induction of dwarf tree size and of early and sustained high yields of large high quality fruit, resistance to fire blight, Armillaria root rot and wooly pear aphid, and ease of propagation.